If you've ever tried to learn Spanish before you know it's impossible to do by just reading a book or taking a course at home. Even 1 on 1 teaching at home doesn't have lasting resuslts. Why? Because you're still thinking in English and living in a world that ISN't Spanish. We have a better way. The only way to truly learn another language is to live it. That's why we have developed a fun way to teach you Spanish, and have an incredible vacation at the same time. You will be completely immersed in the language and culture of one of the most enchanting and safe countries in the world - Costa Rica. Spanish is one of the principal languages of the world. Over 1/2 billion people communicate in Spanish in over 20 countries! Escuela D’Amore is a quality educational institution created to facilitate the learning of Spanish at the most beautiful beaches in Costa Rica. Adjacent to the school is the spectacular Manuel Antonio National Park, Costa Rica’s most famous rain forest. The school’s location provides the perfect environment to meet the students’ linguistic needs. Escuela D’Amore offers intensive Spanish language courses in a total immersion program. We cordially invite you to participate in a unique study vacation in Manuel Antonio, Costa Rica. By enrolling in the center you will collaborate in the preservation of the world’s rain forests. Escuela D’Amore donates a percentage of your tuition in your name to the World Wildlife Fund. "Studying abroad...forces you not only to speak the language on a daily basis but also to wake up speaking the langugae, to think in the language, and to do everything speaking the foreign language." 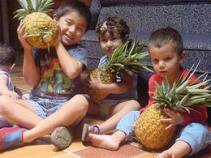 Learning and understanding the Costa Rican culture is one of primary goals of the students of Escuela D'Amore . Costa Rica has some of the finest beaches on the planet for surfing, and surfing is truly just the beginning of all the life changing experiences available in this beautiful country.